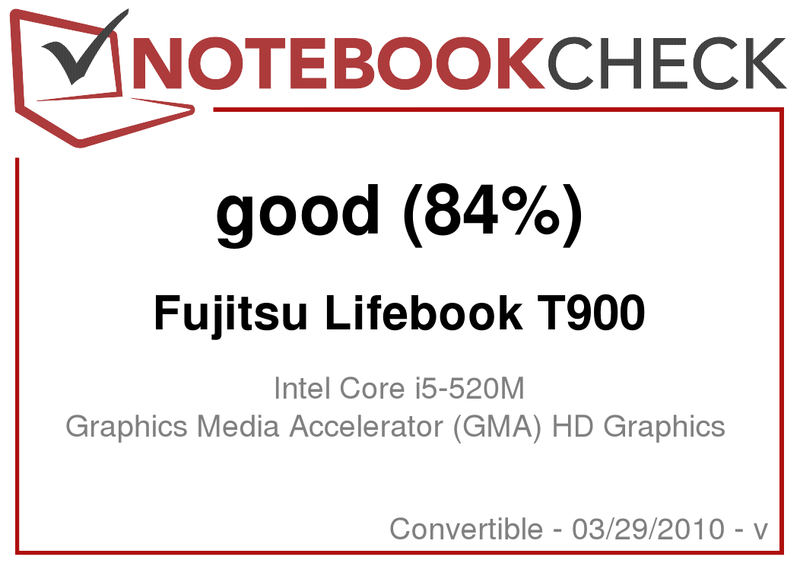 According to Fujitsu, the Lifebook T900 should be an "extremely versatile, lightweight convertible notebook for professional users". 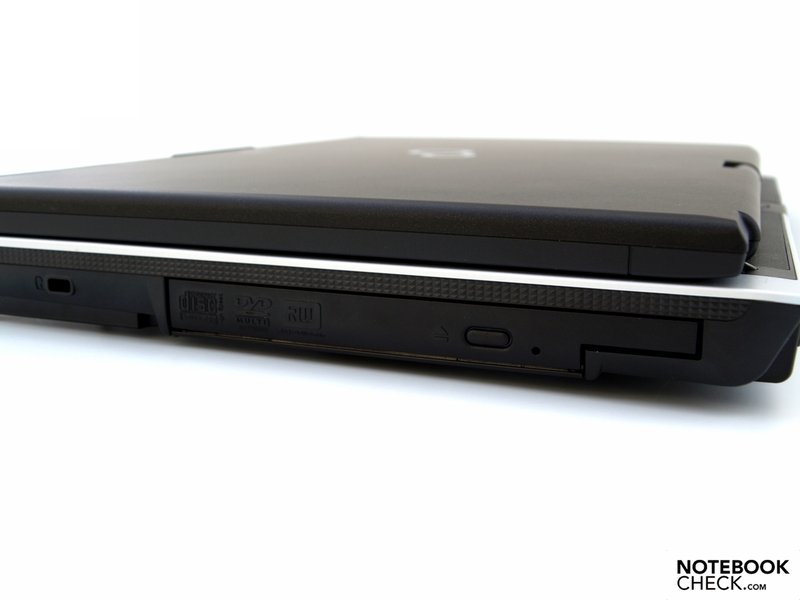 Whether the 13.3 inch model with Arrandale hardware can meet the requirements of such a device, you will find out in the following review. 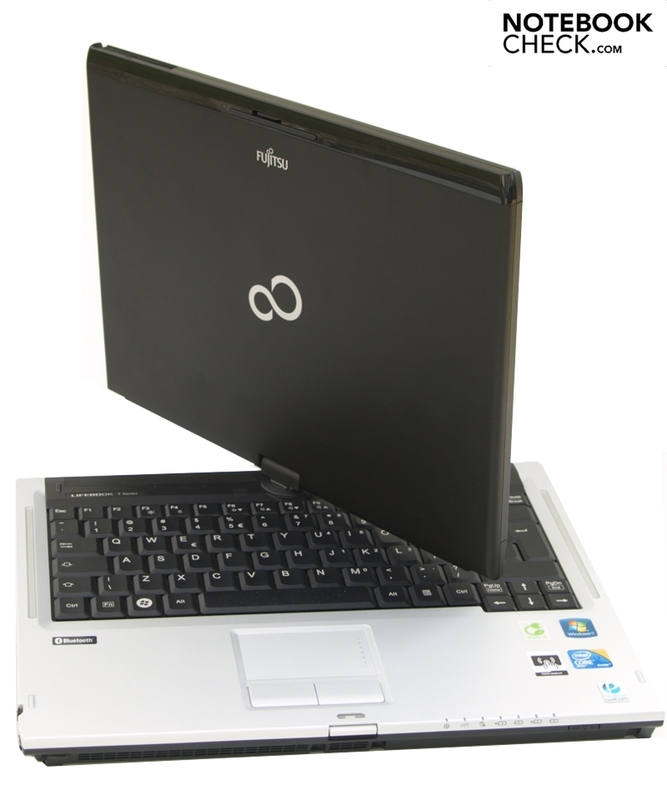 The Fujitsu lifebook has developed the T-series for professional users who appreciate the benefits of a convertible notebook. If the 13.3 inch laptops in this series are still too unmanageable for you, you can also choose from the 12.1-inch Lifebook T-models. Our Lifebook T900 is a 13.3 inch device with Intel Core i5 520M CPU, integrated GMA HD graphic chip, four gigabytes of RAM and a fast 7200 RPM hard drive. The elegant black and white case is partly made of a magnesium alloy. 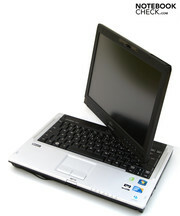 That is why the Fujitsu Lifebook T900, which is a convertible with a touch screen and weighs 2.4 kilograms including the battery, plus about half a kilogram for the power supply, remains relatively light and still rather stable: resistance and torsional stiffness of the base unit and the screen are generally good. The most common weak spot in the ultra-bay slot was apparently unavoidable. With the bidirectional swivel hinge, one can easily switch from tablet to laptop. 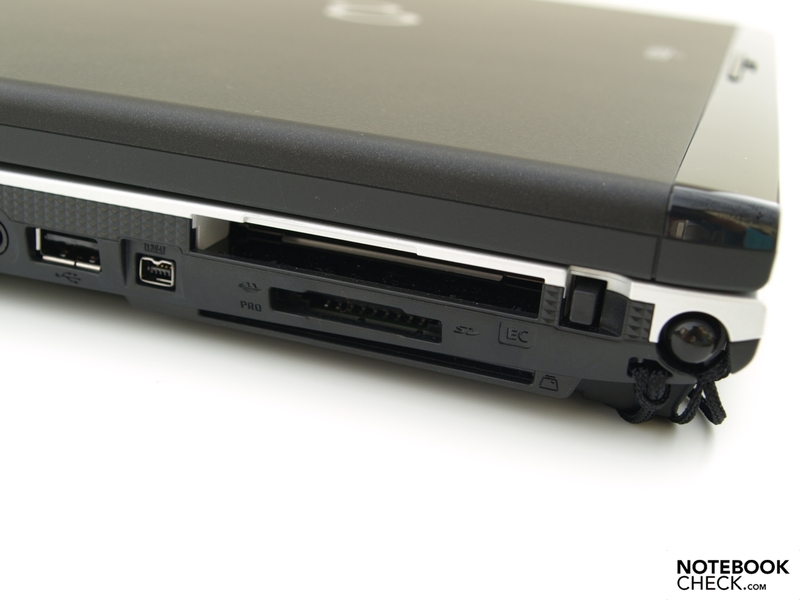 If we use the laptop mode, the hinge works smoothly. 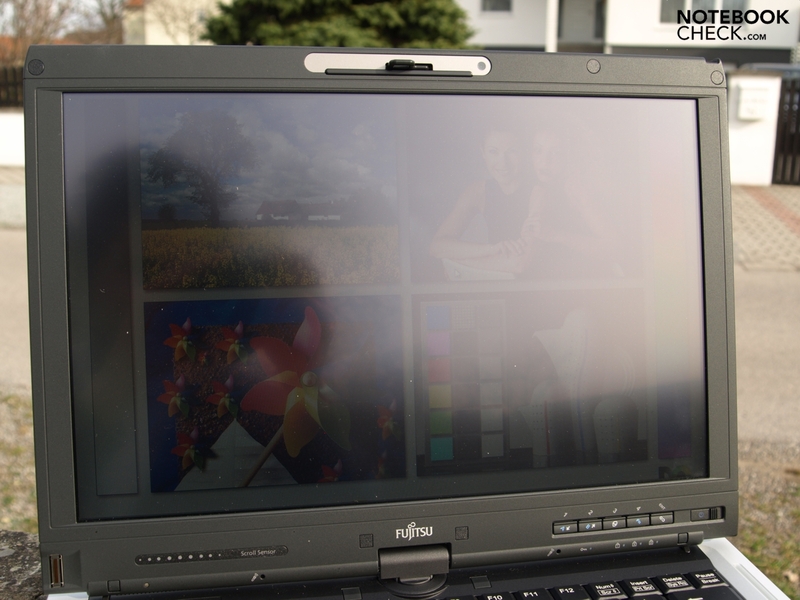 Therefore, it cannot completely prevent the display from luffing after having changed the viewing angle. Similarly, the screen vibrates slightly when you work in jerky environment such as during a train ride. In terms of opening angle, the user does not have any limitations: it is slightly more than 180 degrees. 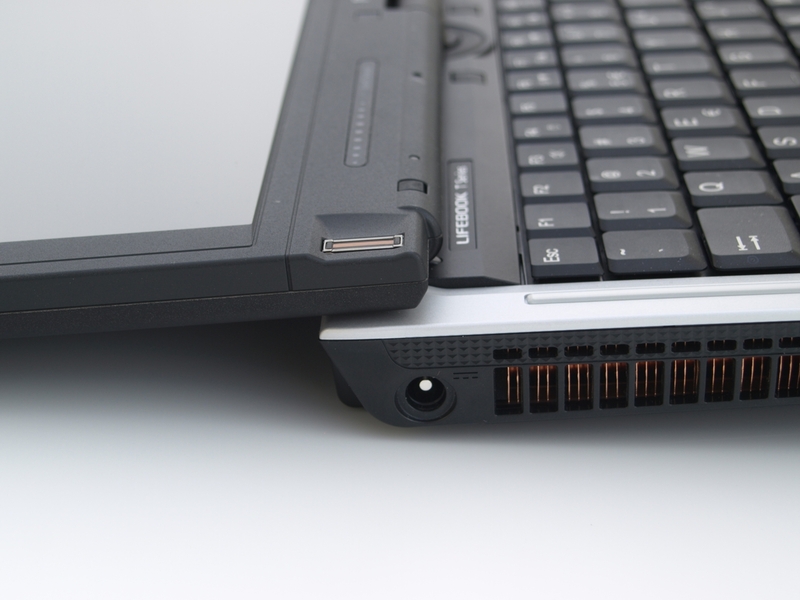 A central closure hook on the upper screen frame keeps the Lifebook T900 securely closed during transportation. You should be careful that the hook does not come in the way of your hand when working in Tablet mode, especially in portrait mode. 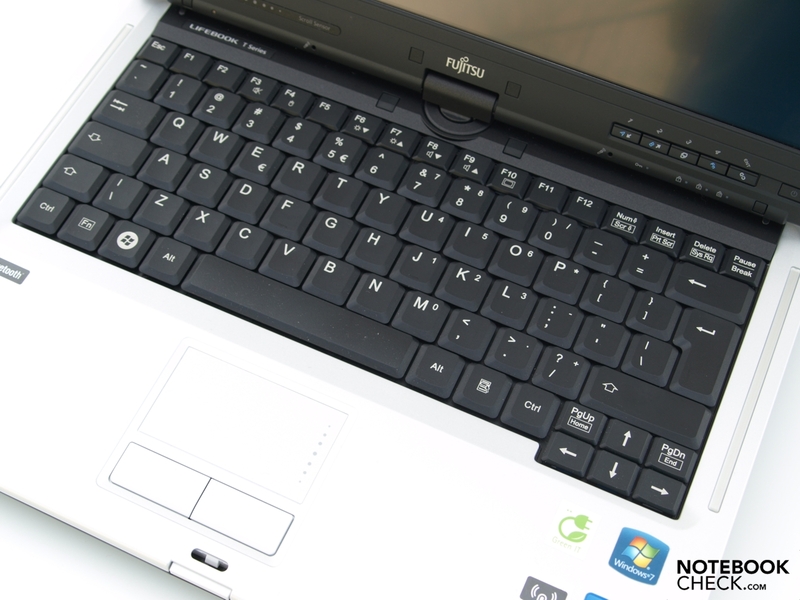 Considering the form factor of the notebook, the interface supply is sufficient. Directly on the frame there is only an analog video output. 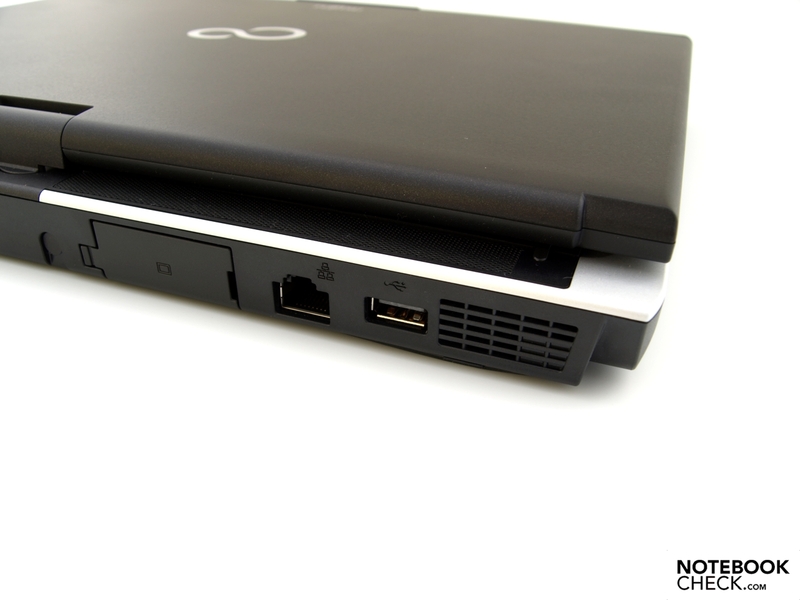 But you can supplement it with the docking port and compatible docking station which are mandatory for business devices. Moreover, a docking solution also allows a rapid and convenient integration of the T900 into an existing work environment. 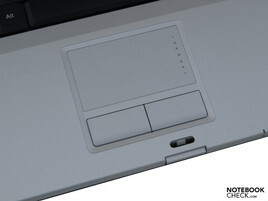 Left side: DC-in, fastening eye for the stylus cord, microphone, headphones, USB-2.0, FireWire, ExpressCard, 5-in-1 card reader, SmartCard reader, slot for stylus. 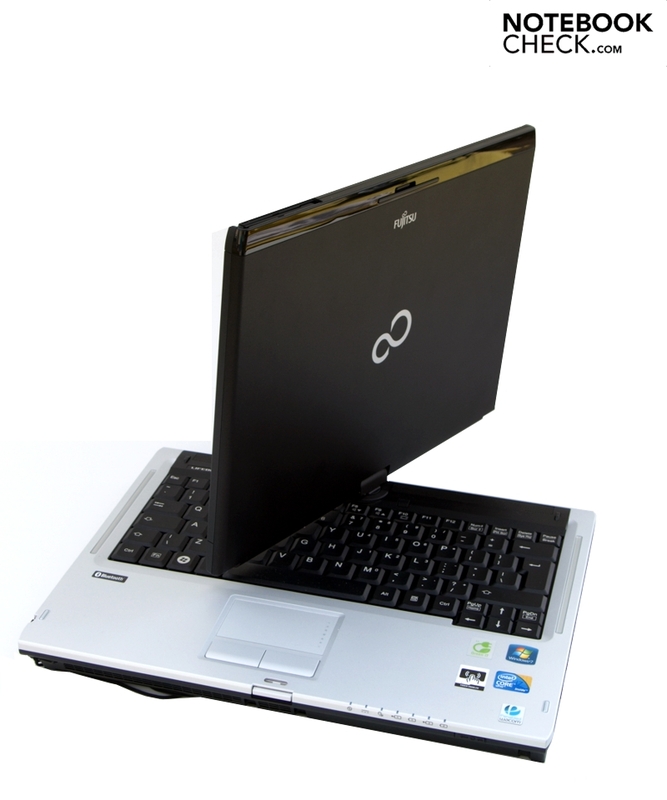 Communicationwise, the Lifebook T900 is usable almost anywhere. Network connections can be done wirelessly either through the built-in Gobi 2000 broadband modem or with the Intel Centrino Advanced-N 6200 AGN via Wi-Fi hotspots. Connections with Ethernet are possible using a CAT5 cable and the Intel 82577LM Gigabit Network adapter. 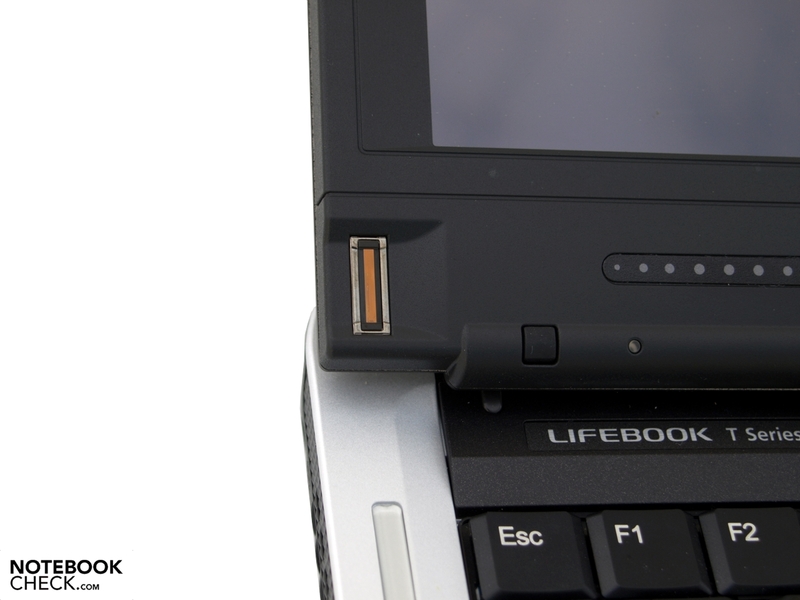 Thanks to the Lifebook’s T900 Bluetooth 2.1, exchanging data with mobile appliances such as mobile phone or PDA is not a problem. Cameras can also be connected via FireWire(IEEE 1,394). Naturally for a business notebook, security features are on board. The fingerprint reader is located at the bottom of the screen frame. In addition, there are two Kensington security slots, a TPM module and a SmartCard reader. Fujitsu presents itself generously with the accessories. In the box of our test unit, we find not only a recovery disk, but also a notebook sleeve, a stylus pen and a variety of replacement tips. 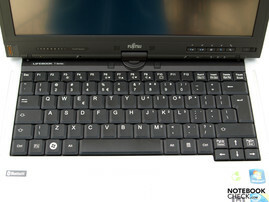 Fortunately the spill-resistant keyboard, which sits firmly in the case, offers a standard layout. Moreover, the mechanical properties of the keys are good: The stroke length is relatively long and the feedback is clear. 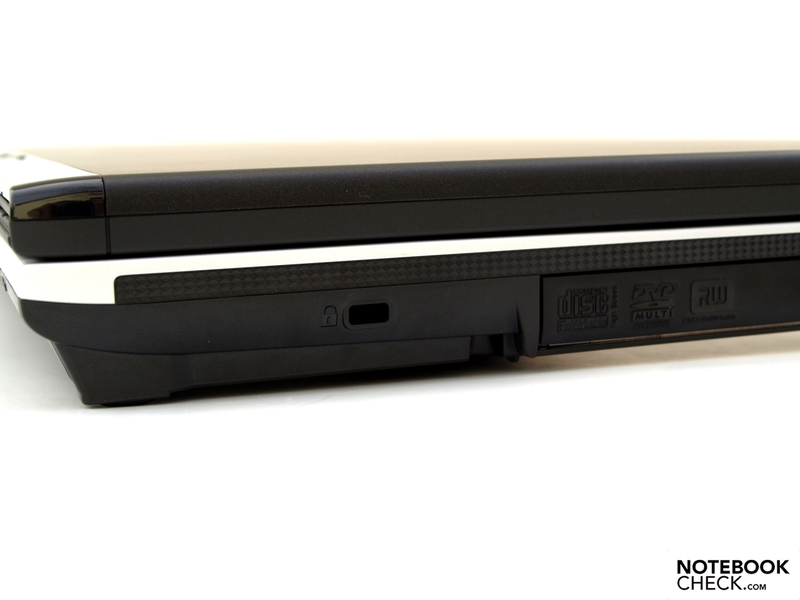 The key size was chosen by the manufacturer generously for a 13.3 inch model. 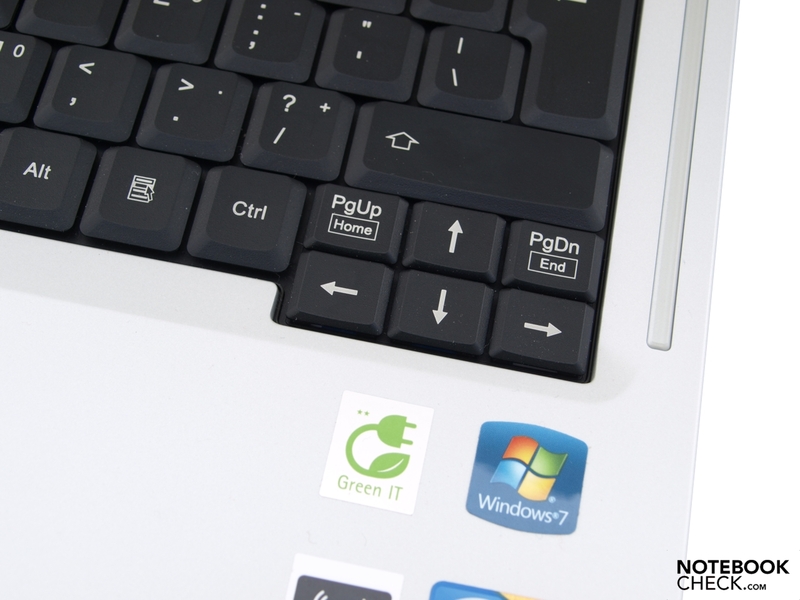 Therefore, from the onset you can start touch typing without any problems. 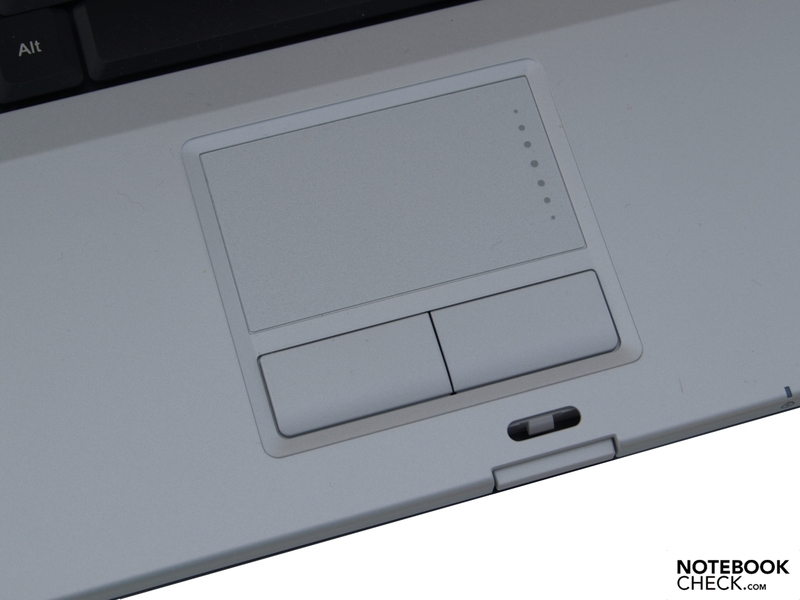 Although the touchpad has (with default settings) no multi-touch features, it performs its primary function excellently - the precise control of the mouse. The slightly rough textured surface feels comfortable and has excellent sliding properties. You can scroll on the right side within a visibly labelled region. 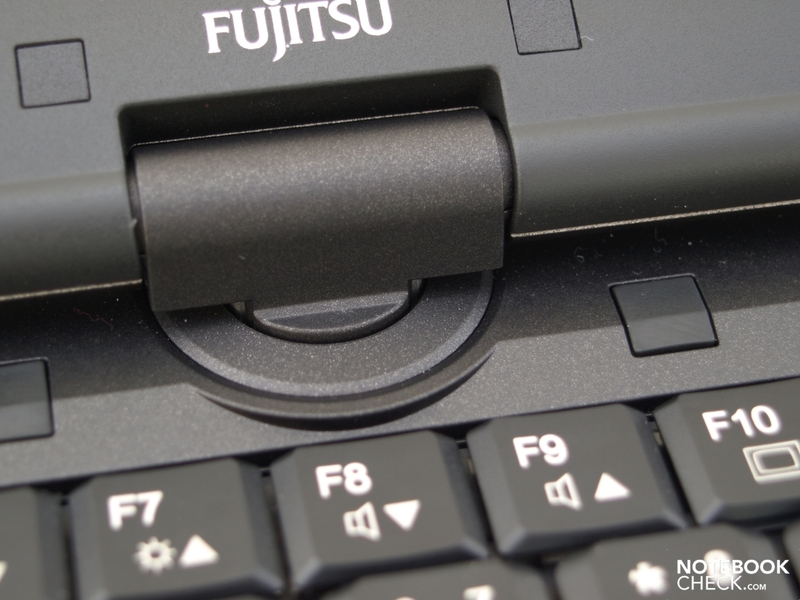 The ability to disable the touchpad is also possible by pressing FN + F4. The two accompanying keys are sensitive enough to react to whichever area is pressed, are apparently centrally mounted, so, the relatively short stroke will slightly vary depending on where you click. The clicking sound gives a clear acoustic feedback. 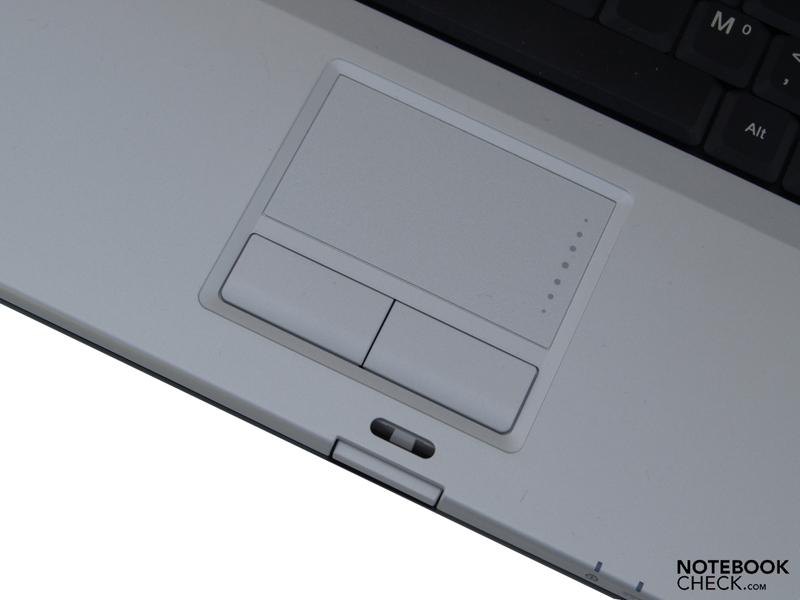 The primary input device of the LifeBook T900 is probably the touch screen. 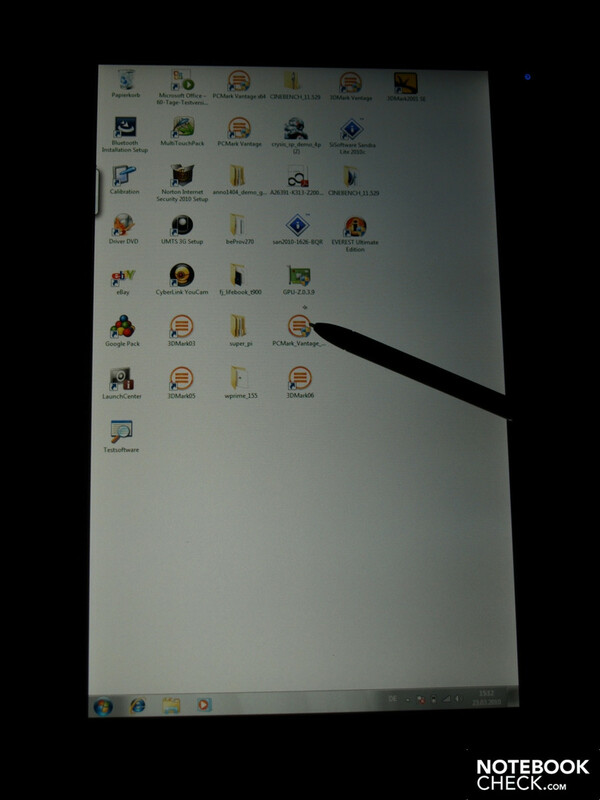 In tablet mode it is the only input option besides some hot keys at the lower display bezel. 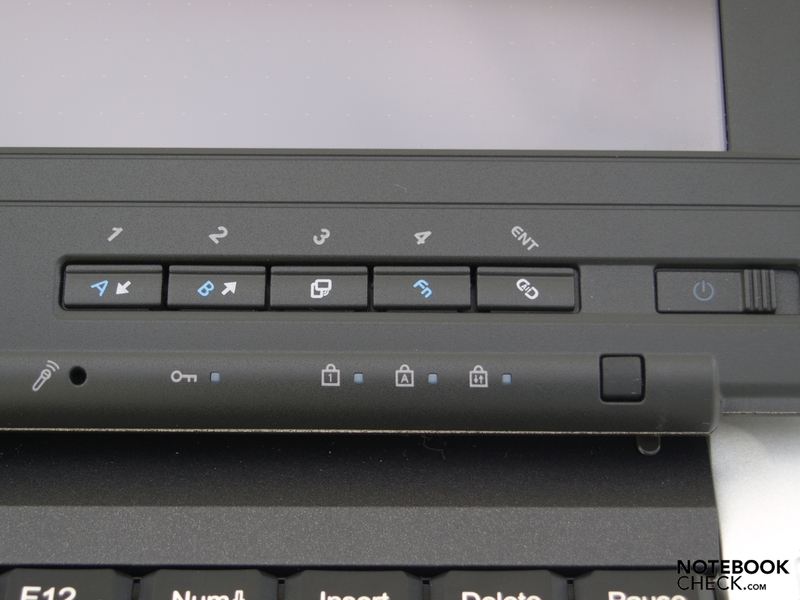 But even in laptop mode one can conveniently and accurately control the cursor and make handwritten entries. 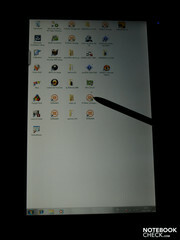 It also supports some of the touch screen multi-touch gestures, such as zoom and scroll. 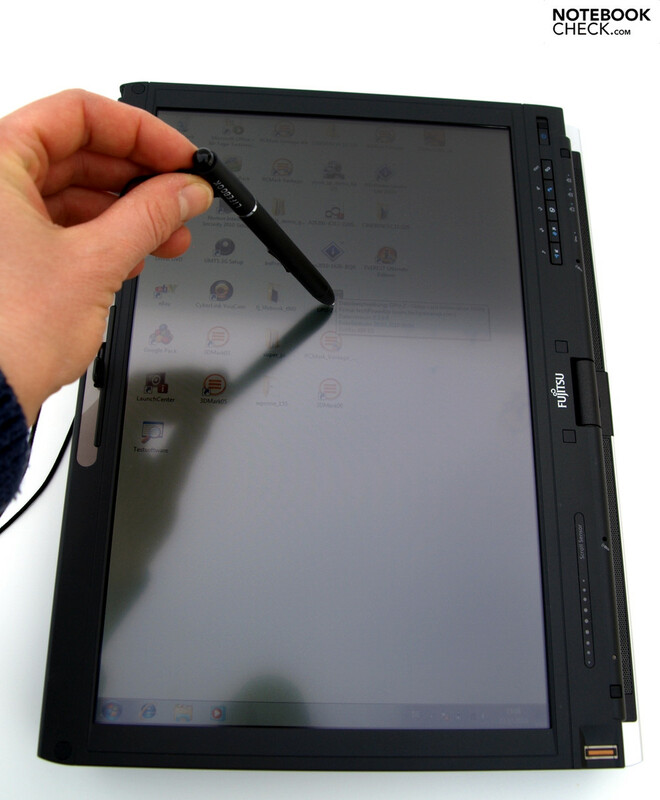 Since a dual-digitizer was integrated in our tester device, which means that an active and a capacitive digitizer supports both finger input and stylus pen. The response and precision was very good for both. Other models have to get along with only an active digitizer. In practice this means that these don’t support the finger input and therefore do not support multi-touch gestures. 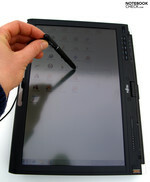 To be able to use the active digitizer right from the start, Fujitsu has enclosed a stylus pen together with replacement tips. You can see advantages of this mainly during handwriting. The "ink flow" on the applied pressure, and by inverting the pen you can easily erase. The buttons of the stylus are programmable. For handwritten notes MS Journal was preinstalled. With this program you can either save or convert the handwriting in print letters. In general, the handwriting recognition works quite well. Moreover, the handwriting recognition is adaptive. So, better results should be achieved after some time. The input by handwriting is particularly good for quick notes. A proficient writer will be able to enter longer texts via a conventional keyboard much faster. In addition, it has to be checked whether the handwritten word were identified correctly. 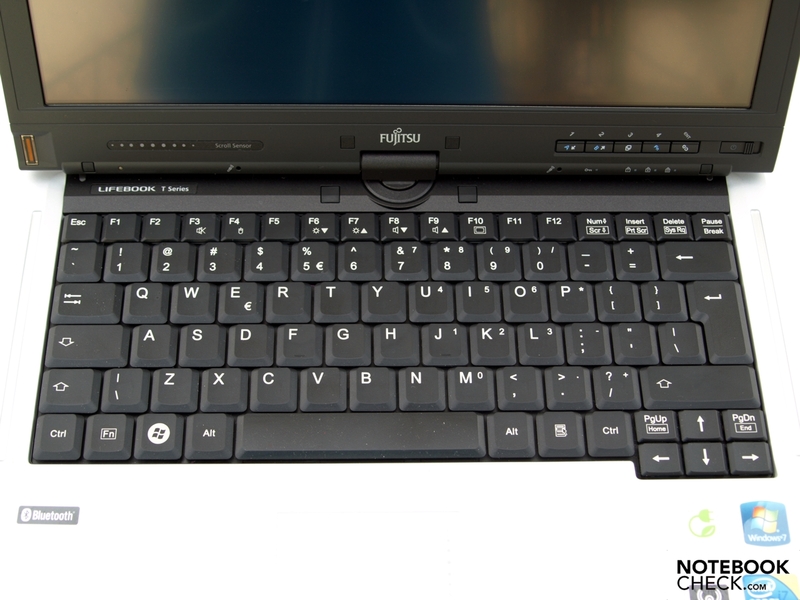 The built-in 13.3 inch screen with LED backlight is also manufactured by Fujitsu and is labelled with the model number FUJ5812. 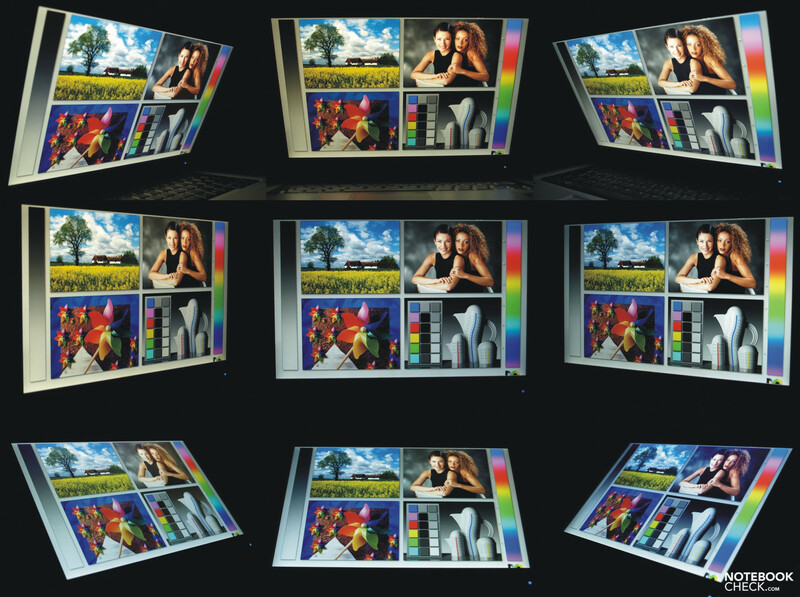 With 1280x800 pixel resolution the display offers a 16:10 format. As it is a business laptop, the surface is of course matte. An ambient light sensor adjusts the brightness of the LED display to the current light conditions in the area. It is located on the left bottom of the screen frame. Through optimal adjustment electricity can be saved the battery life will increase. While testing the screen, the light sensor was disabled. This is simply done via the Windows Control Panel. The maximum brightness of the screen of 257 cd/m² is significantly over the mark of 200 cd/m². On average, the figure remains 214 cd/m² with the brightness dropping significantly. The lower left corner measured only 171.8 cd/m² and with 67% the illumination is rather uneven. In return the screen offers an excellent contrast of 576:1, because of the low black value of 0:38 cd/m² and the good maximum brightness of 219 cd/m² for white in the middle segment. Subjectively, black appears to be distinctly black. In a single colour background a slightly dark fade exists at the bottom. Colours emerge strong and natural despite that the screen has a matte finish, as expected the gradients confirm no shading. Similarly, small fonts remain sharp and readable. 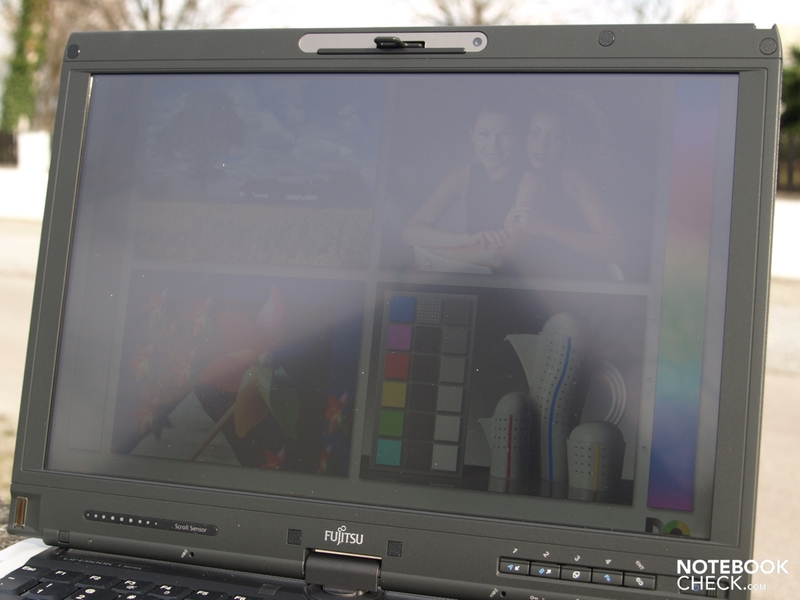 The dull surface allows diffuse reflections especially when the image content is dark, but still the T900 is easy to use with hardly any problems in the shade. In direct sunlight, a bit more brightness would be desirable. Let's mention the actual strength of the screen, its excellent viewing angles stability. Even at a very limited viewing angle the screen content remains clear and visible. Within 45 degrees viewing perspective, in neither the vertical nor the horizontal direction, any changes to the image are visible. The “Wide-View High-Bright LED Display" is giving its name credit. 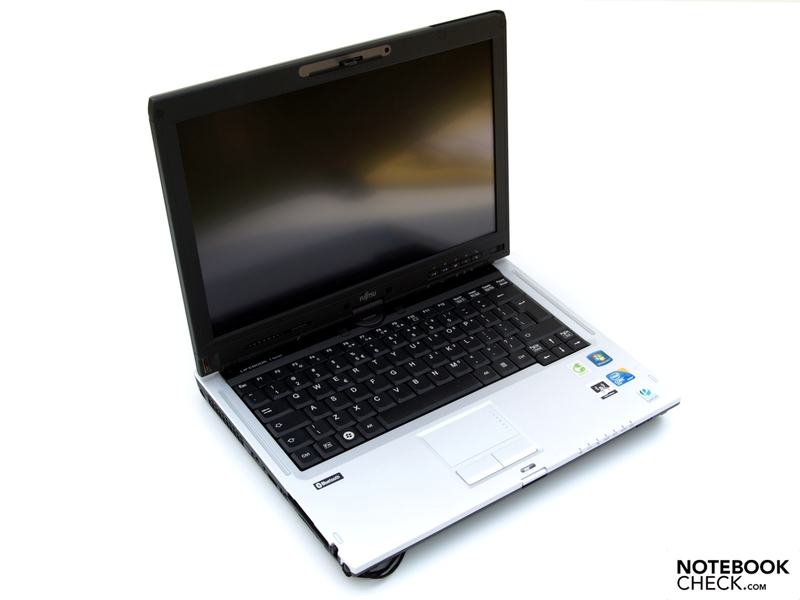 The Lifebook T900 is based on the Intel QM57 Express Chipset so that different processors can be used. 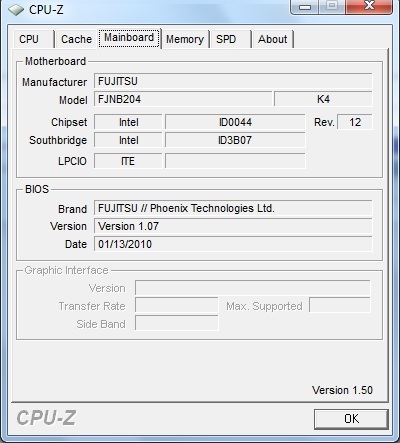 Fujitsu offers models with up to Core i7 CPUs but our test device was an Intel Core i5 520M version. 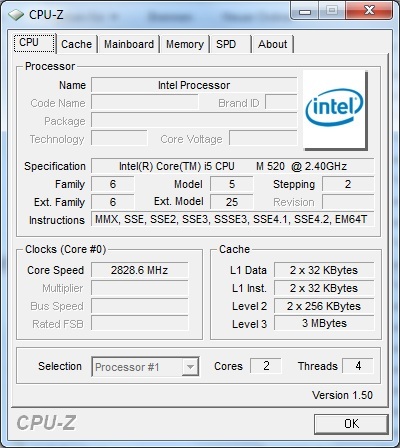 It is manufactured in 32nm process as a dual-core processor. With thanks to Hyper threading, four threads can be processed simultaneously. The Turbo Boost technology allows, if necessary, an automatic overlocking of individual cores. You can therefore expect sizeable computing power, which lies just higher than other Core 2 Duo processors with the same speed. 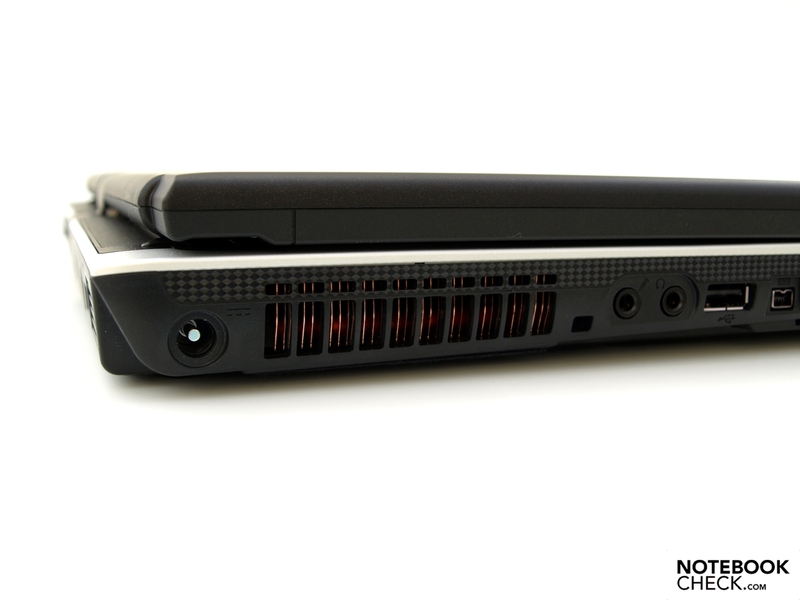 For its graphics performance, the T900 uses an, in the processor integrated, GMA HD graphic chip. This way the offered 3D performance is not at its best. The GMA HD at least supports hardware acceleration for HD video decoding. In fact the MPEG-2, VC-1 and AVC are fully supported. 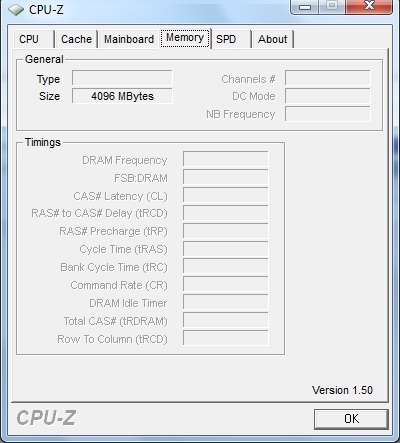 Since the GMA graphic chip does not have a dedicated video memory, it must use a part of the main memory. 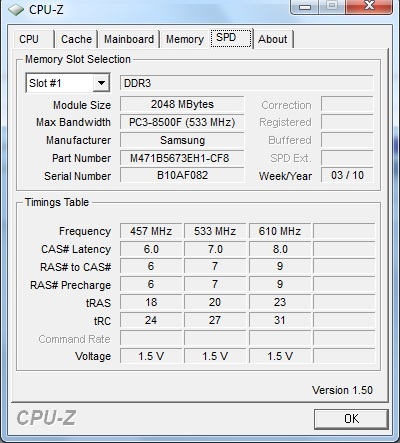 In the reviewed equipment, 4 GB of DDR3 RAM in the form of two-gigabyte modules were installed. These can be efficiently used by the preinstalled Windows 7 Professional 64-bit. A main memory upgrade is therefore not a big issue. It can also be performed by laymen over an easily accessible maintenance cover on the bottom. Since only two slots are available, at least one of the built-in memory bars must be replaced. The application performance, tested with the PCMarkVantage test, in 64-bit and 32-bit version meets the expectations on the hardware. 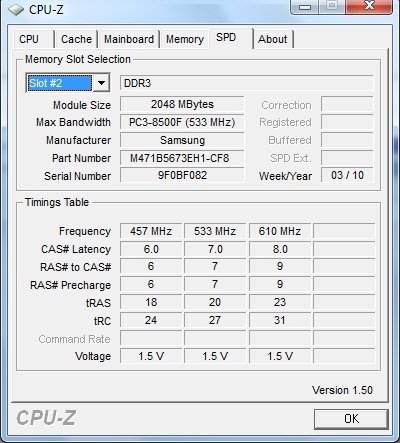 Also the Cinebench and the 3DMark test concluded with no surprises. In short: the Lifebook T900 offers a good computing and application performance. 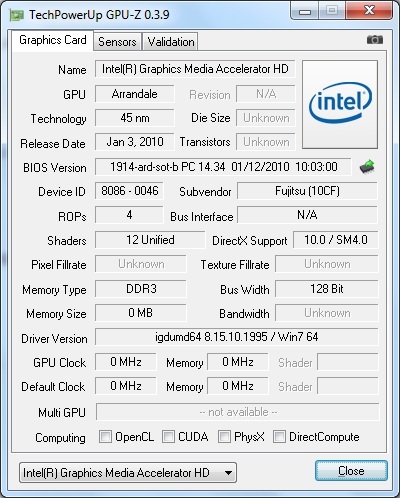 However, the integrated GMA HD graphics chip was not designed for demanding 3D applications. 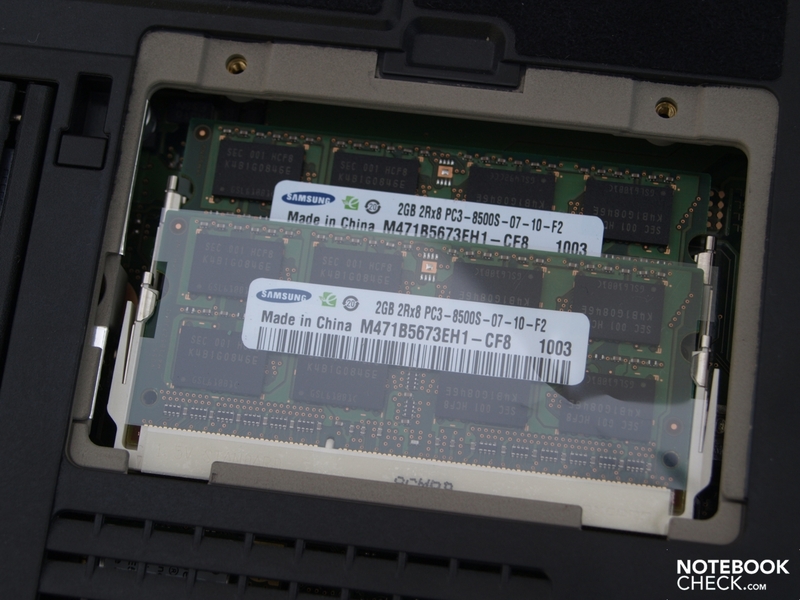 The built-in hard disk drive is a ST9500420AS from Seagate. 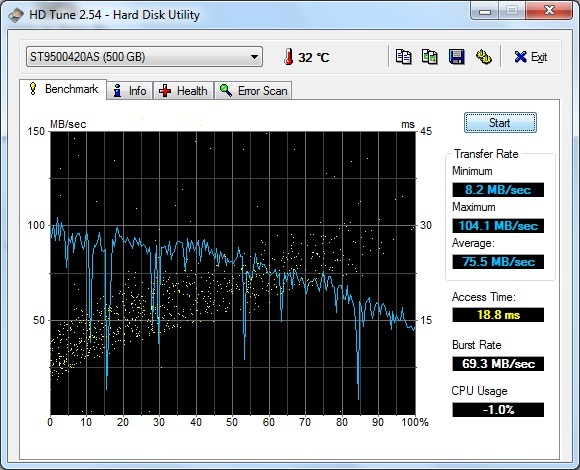 It provides a gross capacity of 500GB and works with a rotation speed of 7200rpm. 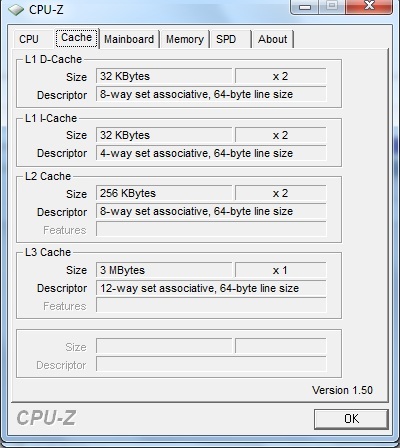 The values determined by HDTune are generally good. However it is striking that the transfer rates sometimes go down strongly in the HD Tune test. 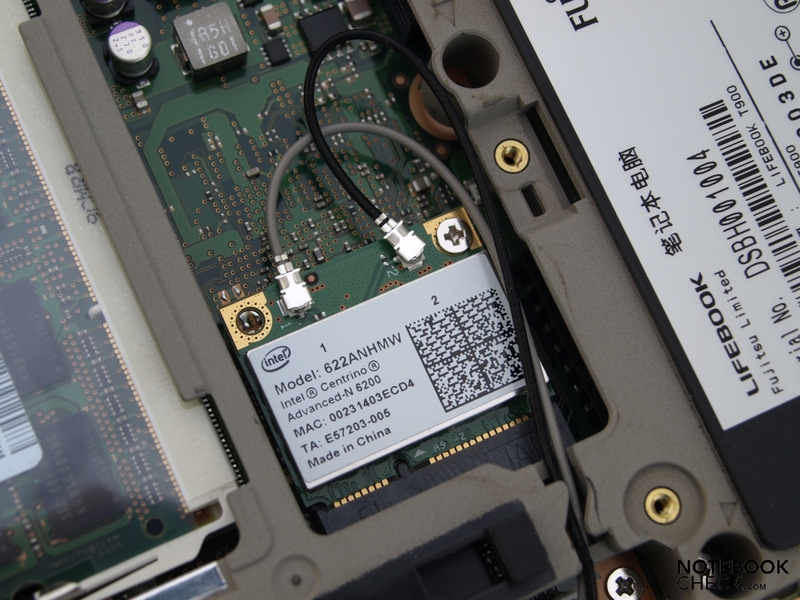 As another mass storage device the CDDVDW TS-L633B DVD drive from TSSTcorp was installed. This can be removed from the module dock also while the notebook is on. When operating under low load the volume level of T900 varies between 29.8 dB(A) and 37.8 dB(A). This decreases every now and then with the fan included. Occasionally a very quiet but high-frequency noise can be heard. 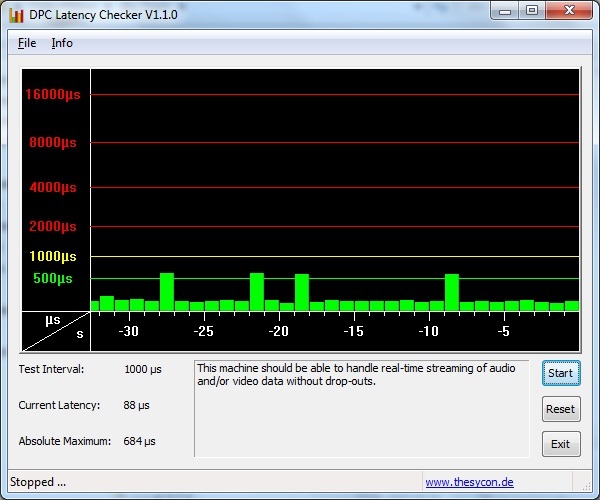 Under load, the Lifebook T900 can be quite noisy. It reaches a peak of above 49 dB(A). However the T900’s hardware is not designed for long-term operation with demanding 3D-heavy applications. If you do not have excessively high demands on the T900 it can be easily used on the lap. Also the wrist-rest and the touchpad remain cool although under heavy load, both the top and at the bottom exceed the 40 degree mark in some places. Fortunately, at least the touchpad and the wrist-rest remain cool. (-) The average temperature of the palmrest area of similar devices was 29 °C / 84.2 F (-3.6 °C / -6.5 F). If you expect a unique audio experience, you will certainly be disappointed with the built-in speakers above the keyboard. The middle values are dominant and the bass is hardly to hear. The maximum volume at which the sound remains clear and undistorted is sufficient enough for indoor use. For a convertible, the sound quality is certainly adequate. To achieve a better quality sound or to avoid disturbing others, it is advisable to make use of high-quality headphones. The test of the 3.5 mm headphone jack shows no abnormalities. With 63 Wh lithium-ion battery (10.8V, 5.4 Ah), the T900 achieved a maximum time of nearly five and half hours during the BatteryEater Reader's test. For this battery check the wireless communication modules had been disabled, the power profile was enabled and the screen dimmed to minimum brightness. While working at maximum brightness, Wi-Fi turned on and "High performance" profile far from an electrical outlet you should get at least 72 minutes. This value has been recorded by the BatteryEater Classic test. In practical tests we were able to watch a movie for over two and a half hours at maximum brightness and "High performance" profile on one battery charging. Internet surfing was possible for almost three hours with good screen brightness and the “save energy” profile. Those who need longer runtimes replace the optical drive in the module dock by a supplement battery. Such is included in the scope of delivery. 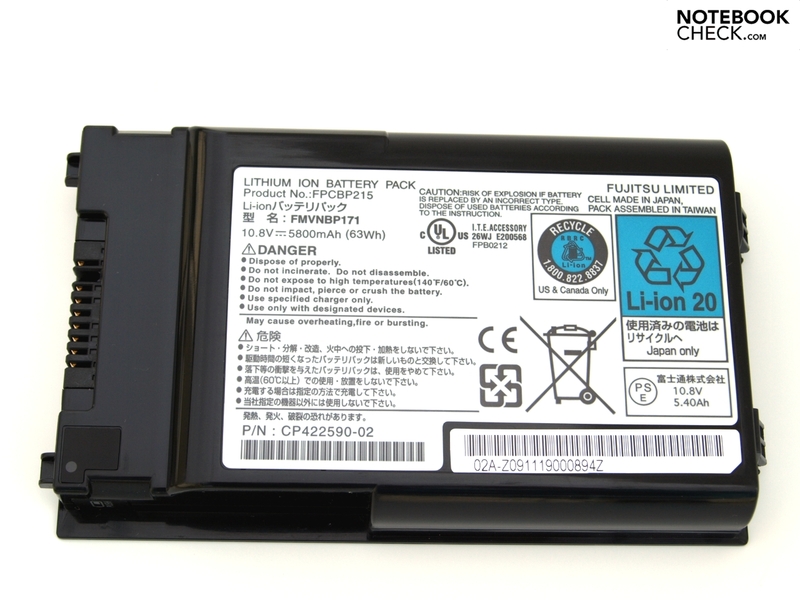 This lithium-ion battery with 41 Wh (10.8V, 3.8 Ah) extends the battery life to up to 65%. Considering the total battery life with both batteries the rating of the battery life was increased. 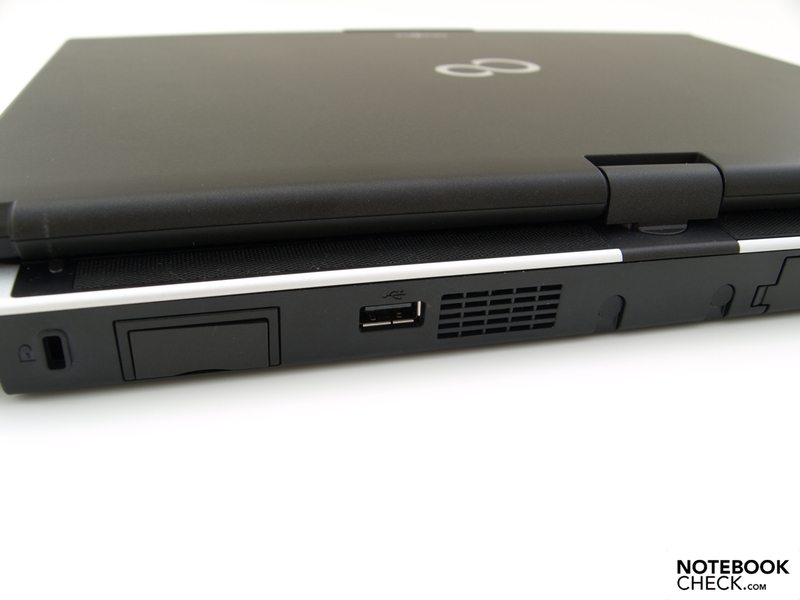 This elegant Lifebook T900 convinced us with its good processing and stability. 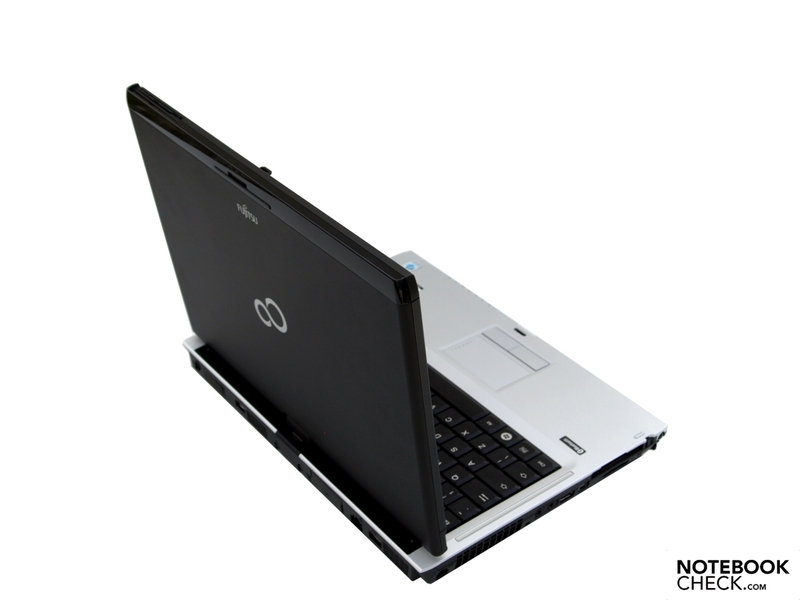 With the bi-directional swivel hinge it can be easily and quickly transformed from the laptop into a tablet. The touch-screen input is satisfactory in both modes. Those who prefer to work with traditional input devices, the T900 also has a superb keyboard and a very good touchpad although without multi-touch gestures. The required application performance is designed for office operations. From the integrated GMA HD graphics chip processor one may expect a convenient but not outstanding graphic performance. 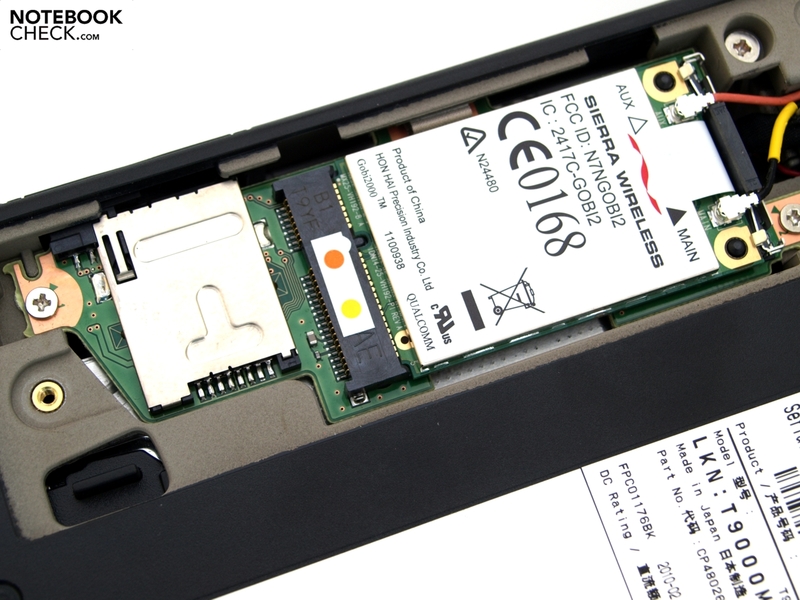 To work longer on one battery charging Fujitsu, provide one supplement battery for the module dock. 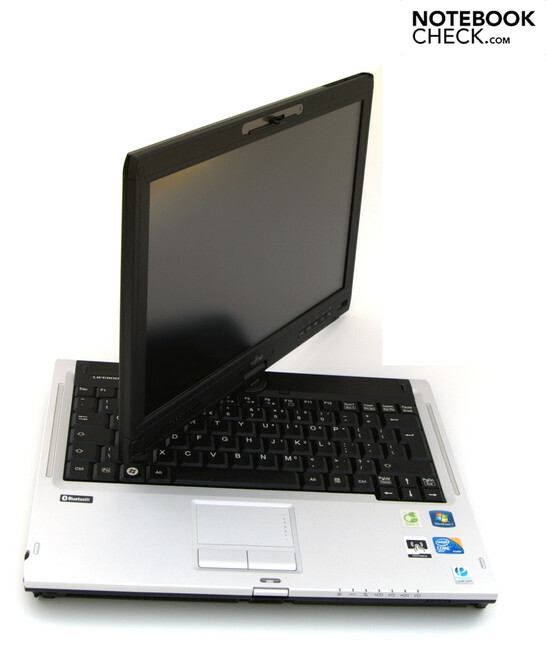 In addition, the Lifebook T900 score points in communication equipment, which except for the WLAN and LAN includes also a broadband modem. With 13.3 inch the convertible is a compact and relatively lightweight device with which a few handwritten notes are possible also on the move. Business users can be happy to use the matte touch-sensitive screen, a number of security features, and good communications facilities. In addition, Fujitsu presents itself generously with accessories. Among other details we like the generous viewing angles of the screen. HDMI and eSATA directly on the laptop would be fine. For these features, good value for money. 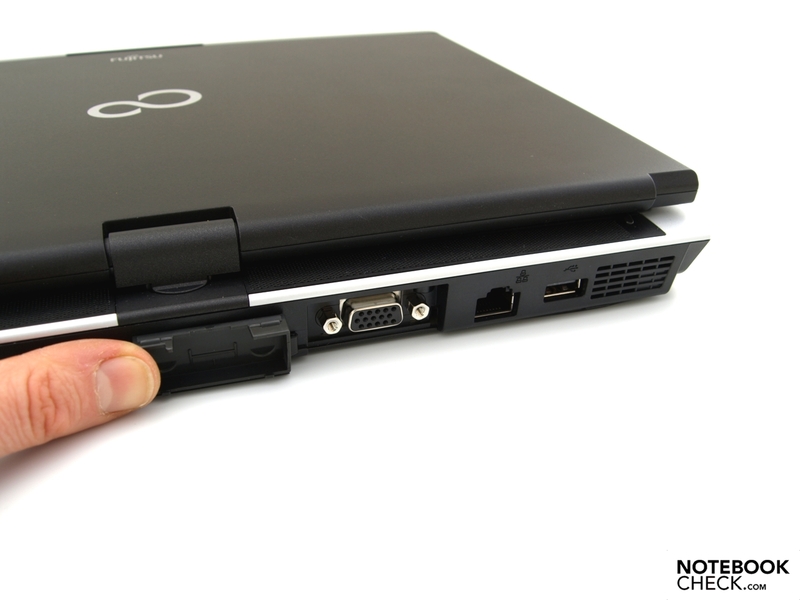 Compact Convertible for Professional use, for example the Lenovo ThinkPad X200t and the Dell Latitude XT2.